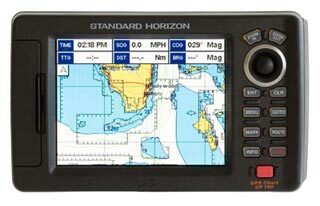 Standard Horizon CP180 | Our unbiased Standard Horizon CP180 review and more on marine electronics here. The Standard Horizon CP180 we tested ships with an external Smart GPS sensor. This unit is one of the least expensive standalone chartplotters on the market today. Another version, the CP180i is equipped with an internal GPS sensor. Our test unit comes with a base map. More detailed cartography is available for display by purchasing and installing a C-Map chart card. We tested the unit with a C-Map Max card covering South Florida; it can also use C-Map NT+ cartography. The compact Standard Horizon CP180 display unit measures 7.3 wide inches by 4.4 high and 3.2 deep. We mounted it with the supplied plastic tilt and swivel bracket. Connections are made on the back panel with twist-lock connectors. The display unit can be flush-mounted with supplied hardware. The CP180 will interface with radar, AIS, the Standard Horizon FF520 black box sounder, and NMEA 0183 capable devices. The Standard Horizon CP180 had one of the brightest screens we’ve seen in a unit this size and we rated it excellent for daytime viewability. The screen has a landscape layout, resolution of 320 by 240, and a diagonal measurement of 5-inches. Even when we looked at it from obtuse angles it remained bright and readable. Wearing polarized sunglasses has no detrimental effects whatsoever. The CP180 has five color palettes to choose from; we used the Sunlight and Normal to view the screen in daylight. No screen fogging was apparent in the display at anytime during our testing. Buy this Standard Horizon GPS chartplotter here. The one thing we did notice was a somewhat cluttered appearance of onscreen data when the unit is ranged out to cover a large geographic area. This is simply one compromise that occurs when viewing lots of information on a small screen. A quick press of the Power button puts the screen brightness controls onscreen. Sliders can be adjusted using the joystick to one of 6 levels for brightness and one of 20 levels for contrasthitting the Enter key locks in the setting. We used the Normal and Night palette to rate nighttime viewability of the CP180 good. We did note slight screen darkening at steep viewing angles at night. The CP180 can display three main navigation pageschart, navigation, and highwayall are selected from the main menu. Selecting the chart navigation page displays a map page with optional user customizable data boxes. The navigation page shows you where to go using data boxes and a compass rose while highway shows data, a compass tape, and a virtual highway. The CP180 celestial page shows a variety of valuable information. Other main menu data selections include celestial, GPS status, and NMEA data display. If you have a black box sounder or radar connected these pages are selected from the main menu too. In Standard Horizon parlance waypoints are referred to as marks. To create one from the chart page you hit the Mark button. This creates the point onscreen. To work with the newly created waypoint youd move the cursor over the point and select an action. Edits are accomplished using a small data box while the chart page remains visible as the background. The CP180 has a dedicated Go To pushbutton, pressing it lets you navigate to the cursor or a waypoint. Building a route with the CP180 is easily accomplished on the chart page by pressing the dedicated Route pushbuttonthis lays down the starting waypoint. Each successive leg is added by using the joystick to move the cursor to the next waypoint position then hitting the Route key once more. It is that simple. A single press of the MOB button on the CP180 causes the man overboard function to execute. This immediately displays the MOB waypoint onscreen in red and activates a visual warning onscreen that MOB is active. If you have data boxes displayed on the chart page they will give bearing and distance to the MOB point. Should you execute MOB from the sounder page or any other page all youll see onscreen is the visual MOB alarm. Youll need to switch to another page to get navigation data back to the MOB point. Not a great system in our opinion. Hitting the MOB button again lets you choose another MOB point or deletion of the first. If you choose delete, then follow up with a push of the clear button to erase the data and point. To check chart redraw speeds we tried to change the map range five steps in quick succession. You cant do this on the CP180, instead after each range step the chart must redraw before the next range step can be selected. We still found chart redraws to be fairly fast on the CP180. The CP180 has North Up and Course Up chart orientation modes; we tried both and found North Up worked well. The Course Up mode was a little slow to follow as we made slow speed turns with the test boat. The Standard Horizon CP180 can store up to 600 waypoints and 20 routes. Waypoints are identified by choosing one of 16 symbols and can use up to 10 characters in the name. The display unit is waterproof and has been tested to withstand sprayed water. Water intrusion is covered by the warranty. Tidal information and port services can be found by using the joystick to place the cursor over an area and pressing the Info button or by choosing Find Services from the main menu. A top notch screen, good ratings for operation, and a long 3-year warranty combine to make the CP180 a steal for boaters looking for an inexpensive GPS chartplotter.